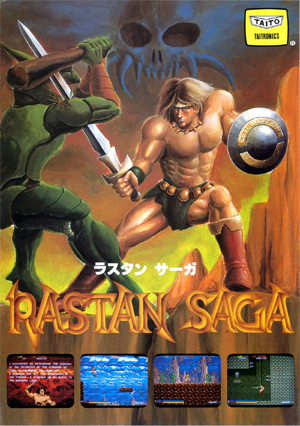 Rastan Saga (ラスタンサーガ? ), released in North America simply as Rastan is a hack and slash platform arcade game developed and released by Taito in 1987. The game is considered by several gamers to be best known for its music by Naoto Yagishita and Masahiko Takaki, which has been used in many remixes. The Taito Corporation (株式会社タイトー, kabushikigaisha taitō?) is a Japanese developer of video game software and arcade hardware wholly owned by publisher Square Enix. Taito Trading Company was established by a Russian Jewish businessman named Michael Kogan. Taito also imports and distributes American coin-op video games in Japan, as well as their own games all around the world. Taito Corporation was acquired by Square Enix in 2005. 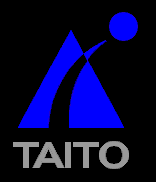 Taito Corporation currently has divisions in Seoul, South Korea and Milan, Italy, and a subsidiary in Beijing, China. In the past, the company had also operated divisions in North America and Brazil.